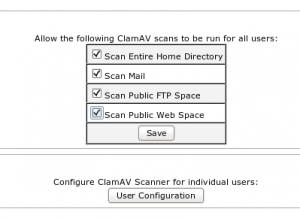 ClamAV is an popular open source anti-virus toolkit for *nix, and while many people don’t find much value in using antivirus software on Unix, it is very useful for email scanning. cPanel’s implementation allows end users to run scans on their home folders, public FTP folders, mail, and public_html. 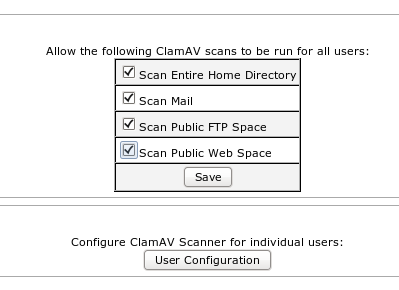 It’s really hard to install ClamAV on cPanel – if you’re too lazy to click a couple buttons. Simply go to WHM > Manage Plugins and enable the ClamAV Connector, and you’re good to go. You should now see a Virus Scanner option in cPanel. If you don’t, you may need to enable it in Feature Manager. From here, cPanel users can run scans on any permitted items. how do i upgarade the clamav software it self, with out braking cpanel ? Hello, in the version 11.38 (cpanel) ,clamconnector is not exist 🙁 , how to install clamav ? Your command is not working on server but i found sum command thats working. I am using to to scan with delete as below.